Never quite thought of myself as an entrepreneur or even that I would become one, but somehow that is just what has happened over the last few years. Most know my story if they read and follow this blog of how I was a middle school math teacher, who lost my teaching job during my pregnancy with Lily (my second) only to find myself unemployed and unsure of what to do next. 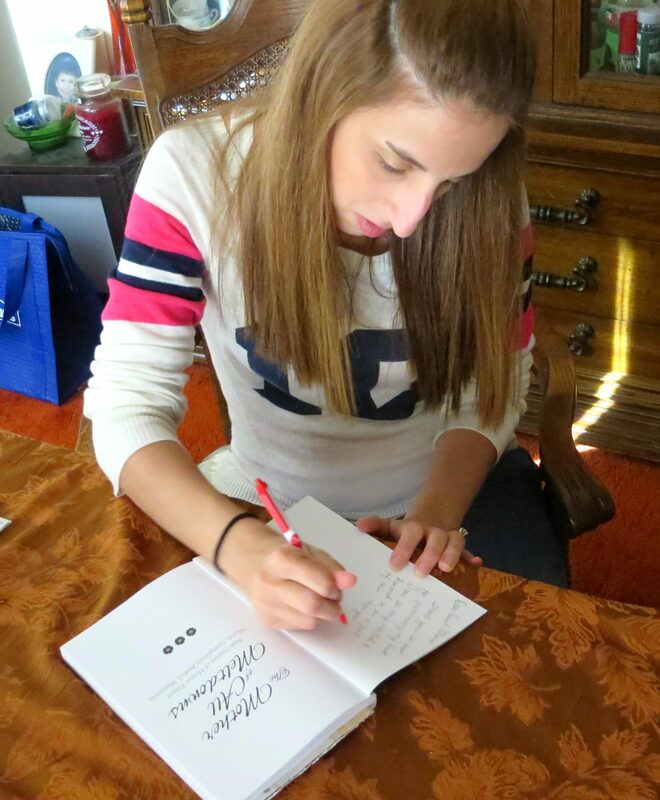 Never would have gotten as far as signing a copy of my own book contribution, if I didn’t believe in myself! What occurred still sometimes amazes me to lead down the path of freelance writer, blogger and eventually blog/website designer. I recently was asked by a prospective client to describe myself and how I became to indeed do what I do. When I heard myself explaining my tale and the excitement in my voice when I did, I knew more then ever it was truly worth it and then some that I had become an entrepreneur. But in hindsight, I did all this on very little funding or backing, but still somehow made a go of it. Trust me not patting myself on the back, but still very glad I made this move to become an entrepreneur, but do wish I may have had more financial support and backing when I started my journey to be honest. To that end, I recently learned of MUMZY™, which is the first and right now only viable crowdfunding platform for a mom wanting to become an entrepreneur. it’s a fairly new platform that is gaining momentum, but again is still in its most infancy stages founded by Catherine Merritt, a MOM of two boys and never-ending idea-comer-upper. When she had her oldest son, Teddy, she had her first mom-inspired invention (and it was a great one!). But with a lack of resources and funding options, her idea never took off. It did, however, pave the path for MUMZY™ and here we are today! You might be asking how MUMZY™ is unique or different from other crowdsourcing platforms out there. Well for starters is was created as stated by a MOM and in addition to raising capital for projects, MUMZY™ is specifically for MOMS, which is an underserved category segment populated by some of the most innovative and inventive budding entrepreneurs. Because motherhood really open the door to inspiration and ideas! But are sleep-deprived moms really able to spend extra time coming up with new innovations to lead to becoming an entrepreneur ? Women’s lives with babies, toddlers, children, are a world full of never-ending pains that they’re constantly trying to identify solves for. If you don’t believe me, like I said above I am living, breathing proof of this. I knew back when I lost my job, I needed to come up with a new way to make money, but honestly wanted to be able to stay home with my own kids while somehow doing this. Did others think I was simply living a pipe dream when I first began? Many didn’t think I could do this. Trust me, I hit up against my own brick walls in many around me, who thought I was crazy. I told many when they asked me, why I was doing what I was doing that I simply didn’t want to work just to pay for daycare and have another raise my own children. Are my days crazy and hectic working from home and taking care of my girls though? You bet there are, but still I honestly wouldn’t trade this in for all it is worth! So are you a mom and thinking of becoming an entrepreneur wanting to get involved with MUMZY™? Then, yes you will totally want to look into MUMZY™, because one of the biggest and greatest advantages I found when looking further into MUMZY™ is that they provide their community with project-specific resources to ensure once an idea has reached its funding goals, next steps are discussed and provided to keep the project momentum going. And whereas other crowdfunding sites often lack an overall sense of community, MUMZY™ looks to have a robust community where moms can pledge donations and offer suggestions and ideas to other peoples’ projects. And right now, one of the first 100 people to post a project will have the opportunity to win $1,000 towards their project’s funding goal. Join MUMZY™ today to become the next mom entrepreneur! I think that Moms have some of the best, most practical ideas out there. After all, Moms are in the trenches… with childcare and school and taking care of the home. Not to say that Dads aren’t doing these things, but for many Moms, these areas are their primary area of focus. And when you are playing Candyland for the 1000th time, you might just be hit with a stroke of brilliance! Love to see anyone with a great idea get the financial support to bring their idea to life. This sounds awesome if you ask me. Who knows better than moms, right? I just checked out Mumzy. I love all the ideas on it. I also love that they are giving all that money away. It is a great website to help moms start making their dreams come true. You are an amazing mom, wife, and author. Great resource, Janine. I’m sure this will be very helpful for someone out there reading this. Power to the entrepreneurs of the world….and power to writers!!!! Congrats to you on the long road to becoming an entrepreneur even if that’s not what you set out to be initially! What a great resource for moms to propose projects and also support one another! This sounds very cool. I really like the idea that is specifically for moms. I think there are lots of moms out there with the next big idea! Moms have the best ideas out there – unfortunately I can’t come up with the next big one! But some mom will, and it sounds like Mumzy can really help. Hmm…I’ve never heard of Mumzy and wish that somehow my business fell into an area that could benefit. It is different sense I’m not selling an actual product. This is awesome, Janine! What a great way to make mom ideas matter! Yes, moms come up with some of the best ideas because we have to! That’s how we roll! That’s how we make it work! Great post and great Platform! Can I seriously have that shirt you’re wearing in the book signing photo? I love it so much! We can be twins! I find myself amazed at what I’m building here with writing and photography. I’m also terrified that I’ll never grow at all. It’s a weird balancing act with that, and fear, and parenting. What a great resource! I only wish I had an idea for a project. I’m not much of an entrepreneur. I think you should pat yourself on the back for accomplishing all that you have, Janine! Moms have some of the best ideas that’s for sure. They’re always thinking of how to do things better, faster, and smarter. This sounds like an awesome organization/platform to help aspiring entrepreneurs realize their dreams. Janine your story makes me so happy! I have never heard about Mumzy, but I am so happy I have now! I have a few ideas that are just rattling around in my brain waiting to come out. Even though it’s always good to start an enterpreneur endeavor with financial backing, some careers can luckily be started on very little money (most home- and computer-based jobs, as they oftentimes draw on resources most epople already have). I’ve spend about $150 on my translating business so far to buy a CAT-program; I got the investment back the first order I got. Other businesses are more investment-intensive, like opening a cupcake store. I like the idea of the funding! Have a very happy holiday, Janine! This sounds like a really great company for moms. I definitely want to be an entrepreneur one day. For now, with what I want to do, I’m not sure how and when I will fit in what I want to do. I guess my focus is on having a baby and then I think about what will come of things later when I’m homeschooling the kids and doing more with them as they get older. I guess with time I will figure it all out. What a fantastic idea! There are so many moms with great ideas who could benefit from this! Thanks for sharing. And you really are the example of an amazing entrepreneur!!!!! Your story is inspirational! this is amazing! had not even heard of it and like to think that i’m in the know when it comes to these things. definitely checking this out and bookmarking it! This is fabulous Janine! I know a number of moms trying to make a go of it as entrepreneurs!